All RV and tent sites are situated along the north bank of the beautiful Little Cimarron River and shaded by cottonwood trees. All of the sites are spacious and have their own fire pit and picnic table. There are small portable bar-b-ques available to borrow, and some built in bar-b-ques among the sites, as well as a group area with a fire pit, picnic tables and more bar-b-que facilities. Tent site fees are $20.00 + tax for one person per night, plus $5.00 + tax for each additional person. Two small tents or one large tent, and five persons maximum per site. 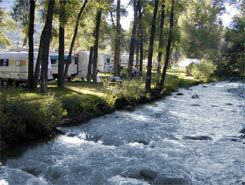 Full hook-up RV sites start at $39.00 + tax per night for up to five persons, plus $5.00 + tax for each additional person. Electric and water only sites start at $35.00 + tax for up to five persons, plus $5.00 + tax for each additional person. Children aged 3 and under stay for free. The shower facility is free for all guests staying in the park. There is a $6.00 fee to use the shower for non-guests. A towel can be rented for $1.00. Rates are available upon request. Reservations are accepted with a one day deposit. Please download and carefully read our rental agreement below (PDF file), fill out the last page, and either mail it to us with your deposit or bring it with you if we have already taken your deposit over the phone by credit card. You can also fill out the rental agreement upon arrival.